The following is the report on a comparison test between the Divnick adjustable golf club with loft-degrees set to correspond to steel-shafted 3,4,5,7, and 9, modern irons. At your request, Golf Laboratories selected the best-performing irons we have ever tested so you can know and tell your customers how your club compares to modern irons used by professional golfers. We cannot divulge the name of the clubs or refer to the company by name since they were not a partner in the testing. But you should know that the irons are made by one of the largest club makers, and in the bag of many of the pros. The speed was adjusted based on the Divnick at 90 mph head speed. All clubs were hit at this load (the energy output was constant). All clubs were hit in the center of the club face for this test. The numbers measured were the carry of the golf ball and its distance from centerline (dispersion). The trajectories on both the Divnick and the name-brand irons were nearly identical. The Divnick had a swing weight of D-0 and the irons were D-1. The testing matrix went as follows: To minimize wind affect, each club was hit 12 times, with the Divnick being hit first, then the corresponding iron, followed by the Divnick, etc. The summary numbers below were calculated by adding the individual averages of the 12 shots per loft and dividing by the total number of clubs. You should be very pleased with the results. They are quite surprising. It has been a pleasure to work with you and if you have any questions regarding the data, please call. Thank you. As you can see, the bottom line of the Golf Lab test report is: "The DIVNICK hits a little farther and is 21% more accurate or predictable!" The 21% accuracy conclusion is a combination of the centerline dispersion (10% more accurate) and the distance dispersion (33% more accurate). This certainly helps to explain why people like the results when they hit with the DIVNICK. Would your score improve with 21% more accurate shots? That's a lot closer to the pin! How can a golf club with a transmission inside the head and a telescopic shaft hit farther and be more accurate than a name brand non-telescopic club? Logically, our greater distance average is because the constant shaft length is a little longer than the average shaft length for the iron lofts tested. Of course, a driver-length shaft can generate more club-head speed and hit even farther which is why some customers purchase our telescopic Tee & Fairway Drivers. But in the world of golf physics, longer shafts and greater distance always produce less accuracy. Not so with the DIVNICK. The reason it is more accurate is because of our proprietary shaft technology which delivers the head to the ball more squarely. This is perhaps more amazing than the adjustable technology in the head because it is a 3-piece shaft with 2 overlapping sections. But the way we machine the joints and a proprietary insert piece, it out-performed even our expectations. Many thousands of research dollars are spent in the golf industry each year to achieve accuracy improvements of only 1 or 2 percent. So the DIVNICK, with a 21% tighter shot pattern is truly remarkable. We wanted Golf Labs to compare the DIVNICK to the highest-performing clubs in the market so our customers would know how it compared to the best. Our goal was not to prove that the DIVNICK performs better than a specific model, but that it performs respectably, even compared to the best. The more accurate distance and dispersion was a surprise to everyone. As explained in our operating instructions, golfers can grip the DIVNICK at full length, take full consistent swings, and adjust the loft to achieve exact distance requirements with the half-loft increments. In other words, the club really can "do the work." All you have to do is develop muscle-memory and swing-plane for one swing and stance. The DIVNICK will do the rest. Or, you can "grip down" to replicate shorter length clubs for various lofts and expect at least the same performance as with your conventional clubs. In other words, you don't sacrifice a thing to use the adjustable and collapsible DIVNICK when comparing it to irons! Of course, the DIVNICK doesn't hit as far as a longer-shafted driver, and it isn't as heavy as a wedge for thick grass or wet sand, and it is the most unlike a putter in terms of shape and weight. It will do all of those things, but requires a mental and physical approach. 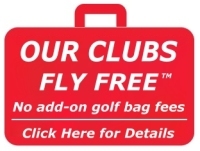 That is why some customers also purchase telescopic drivers and putters or other heads that do the extremes of length and weight better, but still "Travel Free". Other clubs are discussed more thoroughly on our page of Disadvantages. A second test was done a few years later that included toe and heel hits which we refer to on our Compare page. In summary, it is with great pride and confidence that we invite you to test the DIVNICK for yourself. Your own "lab report" is the one that counts the most.